As it is based on Speech Recognition, so works online and what you need is Chrome browser and Internet Connection. No download, no install and even no registration needed, so you can start working right away. It works on Chrome for Android also. It doesn’t mean you can’t use it on other browsers. You can, but you need to enter text manually (voice feature is not supported). 2. Click on Start button and speak. 3. First time, you need to allow permission to use your microphone. 4. On speaking, first your voice is converted into text which is displayed on top. 5. 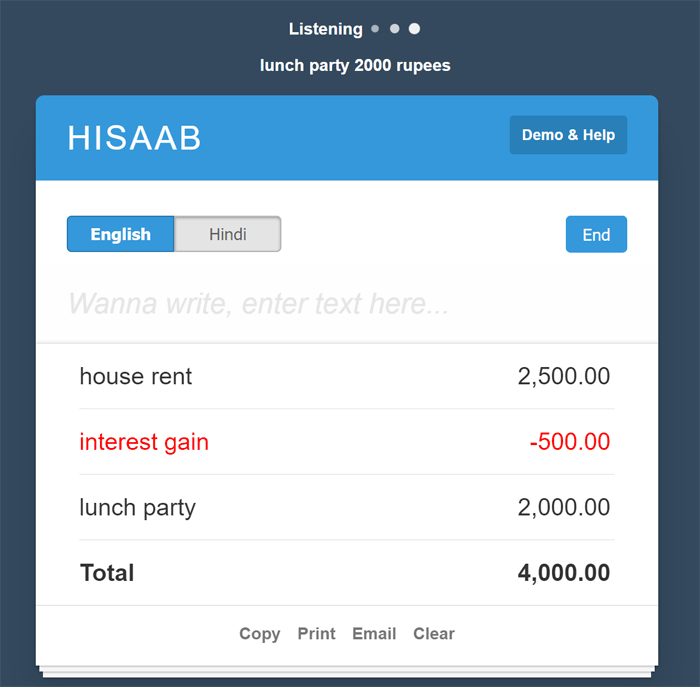 The text is again processed through a language engine which process the text, pick the amount and make expense entry more meaningful and adds on the table. 6. Total will be auto calculated when any entry is made. 7. If you want to subtract Say Minus and the entry will be displayed in Red color. 8. In case of wrong entry, you can delete it with red X button right side of entry. 9. You can Copy, Save, Email and Print the data. 10. If you switch the language then click Start button and go ahead. To unblock, go to the address bar of HISAAB app and click the camera icon in right side. 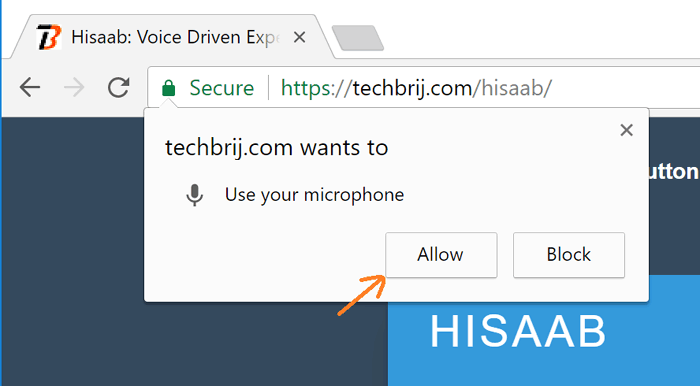 You will get two options, select first option “Always allow https://techbrij.com to access your microphone” and click Done button. Type chrome://settings/content/microphone in address bar and remove techbrij.com from the blocked list. The data is saved on local-storage of your browser (locally). For speech recognition, it sends the speech to Google servers via Chrome over HTTPS (secure) and gets the text which is processed and saved in browser locally. It doesn’t transmit or store data anywhere. Do you want to launch it like an app in your mobile? It’s irritating to open browser in mobile and type website link each time. Just click on icon in home screen is needed. You can setup it as home screen icon. 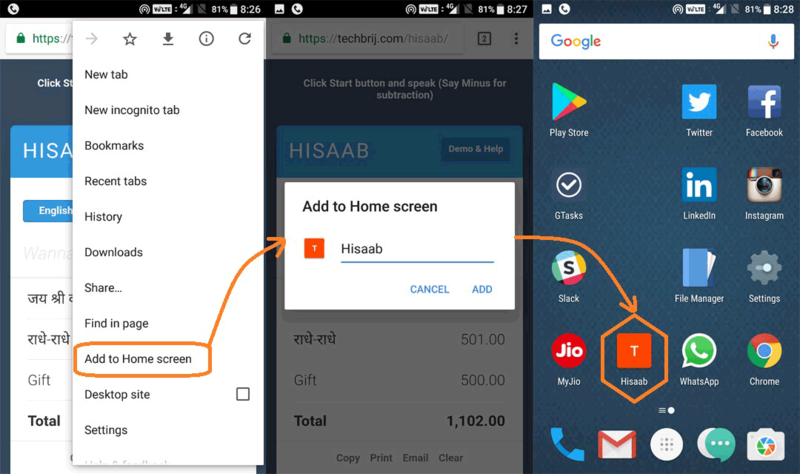 Open HISAAB in Chrome browser for Android, select the “Add to Home screen” option in settings menu. You’ll be able to enter a name for the shortcut and then Chrome will add it to your home screen. The goal what in my mind at the time of development is to track expenses quickly especially on travelling we don’t have enough time to write it down. Now after development, It runs smoothly on PC, desktop, laptop and Chromebook and works also on tablets and mobiles. But desktop Chrome browser is recommended for better quality and operations. If you have feedback, ideas or requests, please comment in the comment box. we will be more than happy to hear from you. If you like HISAAB, Please share it with friends and on social media. The Online tools are very important to the expense tracker which is really important to me. And In this article, you provide the best information about the technology which is very important to me. I am using the Gmail account in the system and if I have any issue then go to the Gmail customer support to solve the problem.